-Innovative design and a new concept. -Maintains the right posture and offers a lower back support. -Regular usage prevents any back problems in the future. -Easy to fit and great to use. -Very Durable and light in weight. 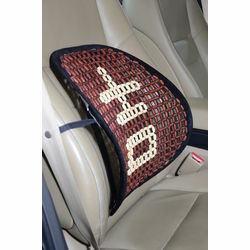 -A must for people driving long hours and suffering back problems. -Can also be used in office chairs, sofas etc. -Breathable mesh allows airflow for cool, comfortable use. -Elastic strap secures backrest in place. -Innovative design and a new concept.-Maintains the right posture and offers a lower back support.-Regular usage prevents any back problems in the future.-Easy to fit and great to use.-Very Durable and light in weight.-A must for people driving long hours and suffering back problems.-Can also be used in office chairs, sofas etc.-Breathable mesh allows airflow for cool, comfortable use.-Elastic strap secures backrest in place.